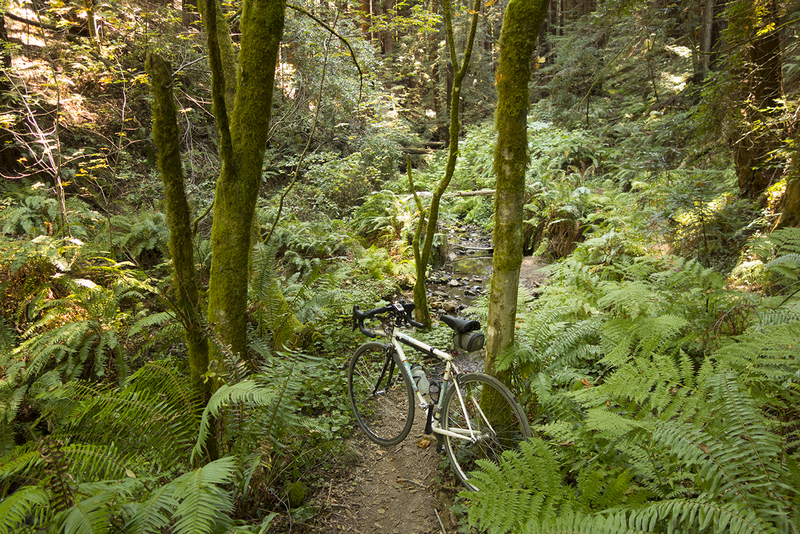 Purisima Creek Road just below the Grabtown Gulch Trail junction. If you were to go back in time to, let’s say 1880, and visit Purisima Canyon, you wouldn’t recognize it. The loggers clear-cut the canyon starting in the 1850s and ending in the 1920s. There was ongoing logging here into the 1960s, but it was more like tree thinning. On Monday morning as I rode down the “trail” from Skyline Boulevard, which I’ve been doing since 1980, I was struck by how much more brush and undergrowth I saw compared to the old days. It used to be pristine, redwoods and little undergrowth. I suppose the difference in plant life is mostly from the lack of logging, but it may also be climate change at work. Water source for the Alvin Hatch Mill. I took a beautiful photo of Jobst Brandt drinking from the creek here in 1981. Most of the redwood was turned into shingles back then, mainly because it was hard to remove trees from the steep canyon over the hill to the port of Redwood City. There weren’t any harbors nearby on the Pacific Coast. The first mill was water-powered, where Harkins Fire Road joins Purisima Creek Road at the canyon entrance. Later sawmills relied on steam engines, or steam donkeys. Borden & Hatch Mill in the 1880s, near where I took the first photo, top of page (From Sawmills in the Redwoods). Going downhill, the first location where two sawmills existed is located where Purisima Creek runs under the road through a large steel culvert. That’s where the road levels out somewhat and there’s a sharp right turn. Right here is where a cable way was installed to haul logs uphill to Swett Road. Purdy Pharis, Shingle King, sunk a lot of money into the project, but it never was successful. He died about the time the operation was underway in 1884. Farther down, at the Grabtown Gulch trail intersection, were two more logging camps, Charles Borden Mill and Hartley Shingle Mill, both operating around 1900-02. Finally another half mile or so below this site was the Borden & Hatch Mill, which ran from 1871-1900. While most of the wood went to making shingles, some was used to build a flume for Spring Valley Water Company in 1871. The nine-mile long flume, located in what is now the San Francisco Watershed (Frenchman Creek and stone dam) lasted 20 years before being abandoned. This was the first time I rode in the Santa Cruz Mountains on a Monday. There’s no traffic to speak of on Kings Mountain Road (2 going up, 5 going down) and the same goes for Tunitas Creek Road. However, Santa Clara Valley traffic during rush hour is no picnic. I’ve learned how to get around it mostly car-free though. This entry was posted on August 23, 2016 at 4:16 pm and is filed under History, Ride reports. You can follow any responses to this entry through the RSS 2.0 feed. You can leave a response, or trackback from your own site. You ride on the paved road and then head up the dirt road / trail all the way to 35? 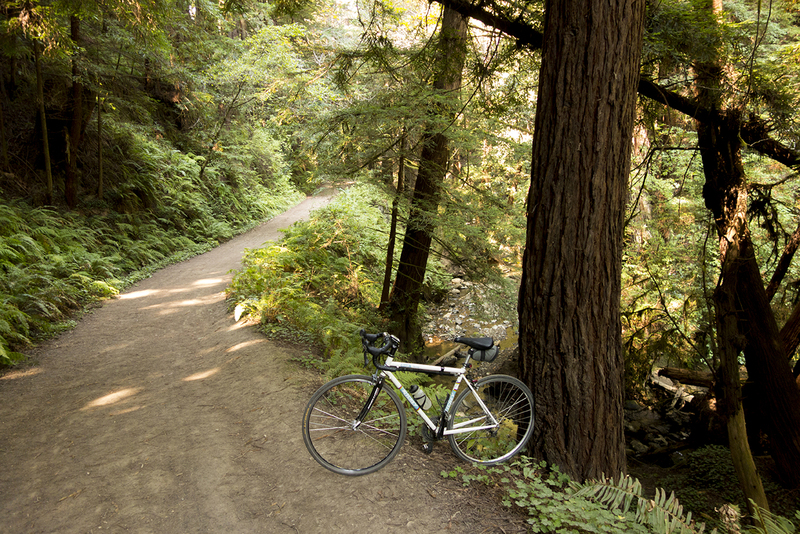 Do you follow Purisima Creek until it ends via the trail to 35? Thanks for the nice post about what is still a largely unknown peninsula gem. How is riding a road bike on the trails? Used to be easy. Not now. I ride down these days from Skyline to Hwy 1. Love that book, great piece of historical knowledge. Great blog post, I rode a variation down Purisma to the coast last May for the first time after reading your excellent Bay Area Bike Rides book ride description. Such a great ride. A few snaps here goo.gl/3dmN6f Thanks for the great blog posts!